There are two sides to learning guitar. The practical and the theoretical. The practical side involves the physical application of your fingers on the strings - the movement from one note/chord to the next (fret hand technique) and the action of plucking the strings (pick hand technique). It covers the physical ability to bend strings, tap, hammer-on, pull-off, vibrato and slide. Without the ability to manipulate the vibration of the string in such nuanced ways, you're lacking what all the great guitarists had and have - feel. Feel may seem a rather ambiguous term when used in the context of music, but both its emotional and physical context apply. You physically feel the music you're playing by knowing how to make the instrument you're holding in your hands speak and sing. You convey emotional feelings through the way you play your guitar. A five minute listen to B.B. King and you'll understand what feel is all about, and what can be accomplished by very subtle physical embellishments with relatively little theoretical knowledge (to which King has humbly admitted). He often uses few notes, but the fluidity of his bends, gentle legato and shimmering vibrato makes those few "words" say so much. The ear is a judge whereas feel is pure intuition. n. The act or faculty of knowing or sensing without the use of rational processes; immediate cognition. This attainment of conveying feeling through your music is, in my opinion, the absolute pinnacle of physical ability when it comes to guitar. I honestly don't care how many notes-per-second you can shred. Playing fast is just one form of expression on guitar, and it conveys something very specific, but it's such a small part of the overall syntax a guitarist can use. So that's the physical side. From the sound of things, you can be a pretty awesome guitarist by just mastering this element, and it's true you can be. You don't need to know theory. There, I said it (you don't realise how difficult it was for this theory nut to write that!). But I want to emphasise the word need here. Just because you don't need something, doesn't mean it can't help you tremendously (you don't need a food processor to blend food, but it certainly helps!). Let's explore how a solid grounding in theory, often called the mechanics of music, can actually help us attain the aforementioned skills of feeling and intution. It's one thing knowing how to get from one note to the next, but first you need to know where to go. Wandering aimlessly, moving randomnly between frets and strings is unlikely to produce anything musical or meaningful (unless, of course, confused wandering is the emotion you're trying to convey!). It's true that some guitarists learn, through years of trial and error, which notes sound good over a particular chord or chord progression. Many great blues guitarists, for example, have limited knowledge of scales, but as they're playing over standards (set keys and chord progressions, such as 1 4 5), they gradually learn which are the avoid notes and passing tones and which harmonise and sound good when drawn out. This is fine for blues (and I don't mean to undermine blues at all - it has produced some truly legendary musicians), but what about more complex progressions that don't conform to a set form? The only way you're going to be able to navigate the fretboard with any fluidity and sense of purpose is to know it well. That involves knowing where relative intervals lie through visual means (that's where charts and diagrams help). Only then will you be able to anticipate what moving from note A to B will sound like. Only then will you have the harmonic and melodic marker points to connect into meaningful phrases. It's theory that tells you where note A lies in relation to note B, on all strings, from any position on the neck. Essential knowledge if you want to be able to improvise confidently and freely, outside of a small, boxed area of the fretboard. Again, given enough trial and error time, you'll work out, with the aid of your ears, which notes naturally harmonise with each other. Training your ear to hear these harmonies is important, but why not cut the time learning this in half? Learning how chords are constructed, for example, will help you connect notes you play in your solo with any chords being played in the background (or vice versa). If the backing chord is Cmaj7, for example, you'll know that Mixolydian as a scale is not an option, or more specifically that the ♭7 is an avoid note over major 7th chords. It might sound dogmatic and constraining to say "this scale/note is not an option!" but sometimes the dissonance is so great, and universally agreed to be so, that it's safe to assume that using that combination of notes will sound dissonant or unpleasant (dare I say... wrong) to most ears. Remember that certain dissonances are less jarring and challenging to the senses than others. Again, theory helps you narrow down these options. The inverse is that theory tells you which "color tones" naturally complement a chord. The major 6th over a minor chord, for example, has an irresistably haunting quality. By being exposed to this through theory, you'll then be able to explore it with real purpose, visualising it on the fretboard in different positions and in the context of different scales, chord progressions and color tones. The process of meaningful musical investigation is often sparked by a theoretical assumption. I've always advised my students to break rules/conventions and experiment freely, although the only rule you should never break is "if it sounds good, play it". A certain amount of trial and error and "noodling" (randomness, messing around) is important in that respect. However, a solid grounding in theory can actually help you see more musically creative and productive options from a given starting point and help you eliminate the options that sound quite ordinary, clichéd or would perhaps work better in a different context. Rather than feeling overwhelmed with every possible direction you could go, likely resulting in aimless and uncreative wandering, theory helps to put that wandering into the context of several possible destinations (e.g. target notes). You can then focus on truly creating something musical and expressive, rather than spending your time constantly trying to get "back on track" or "back in key". Music can get very complex. A study of jazz will confirm this. Theory can help you conceptualise, break down and understand what would otherwise be heard as an overwhelming onslaught of notes. The other way of breaking things down is to find a tab of the song and copy it note for note. But that only tells you how to play that specific piece. It doesn't show you how you could apply it in your own music, without copying it outright. This is about the difference between parrot fashion learning and intuitive learning. What may at first sound complex, could simply be part of a musical system or formula that you can learn. One example of this is modes. By first breaking down where modes come from, you'll eventually be able to identify when music is modal (i.e. it has the "Lydian sound") and accompany it confidently. To someone who hasn't learned the theory, they would be left second guessing, again resorting to a long winded process of trial and error. Before studying theory, analytically, music might seem nothing more than a loose connection of disparate ideas and expressions. As time goes on, by devoting time to investigating what you're playing (theory), you start to see more of an intrinsic connection between these ideas, bound by a system of related intervals. It's from this connection that you get certain "eureka" moments, such as seeing scale patterns merely as a convenient grouping of intervals, the scaffolding if you like, for building chord shapes. Take this a step further, and the lines between typical scale and chord function blur and your focus is less on "scales = lead" and "chords = rhythm" and more on note selection, harmony, voice leading etc. Ironically, this final stripping away of the rules and systems you naturally put in place when learning theory leads you back to a purer view of music, but now you won't get lost in your exploration of the fretboard. The safety net of scales, familiar chord shapes and note relationships is there for when you tread a bit too boldly off the beaten path. That alone makes learning theory so invaluable, especially if you're caught off guard on stage. That is the paradoxical beauty of learning theory - you make rules so you can break them! Yet doing it that way ensures you break them with intelligence, grace and a deeper respect for the intricacies of music. 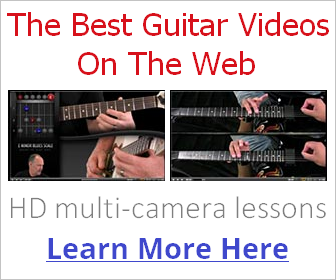 With a solid understanding of theory underpinning a solid physical technique, you'll have the vocabulary to say precicely what you want on guitar, articulately and sincerely.